To Cite: Hossein Pourfeizi H, Tabrizi A, Taleb H, Bazavar M. Giant Cell Tumor or Brown Tumor of a Phalanx in the Hand: A Case Report in a 44-Year-Old Woman, Shiraz E-Med J. 1970 ; 14(2):146-151. Primary hyperparathyroidism is a rare endocrine disease characterized by hypersecretion of parathormone. Giant cell tumor (GCT) of bone arising from a finger phalanx is an extremely rare phenomenon. 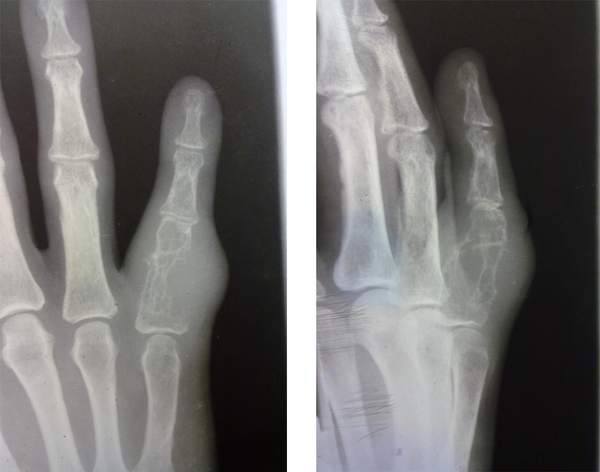 We introduced patients with tumoral mass in the fifth proximal phalanx of their right hand. Although pathology findings indicated to giant cell tumor, she had hyperparathyroid adenoma and treated by parathyroidectomy. Neoplastic lesions gradually disappeared without further surgical interventions. Giant cell tumor (GCT) is a rare benign osseous tumor usually seen at the end of a long bone after skeletal maturity. A finger phalanx is extremely uncommon site for GCT (1). According to literature, only 2% of GCTs are found in hand (1, 2). The metaphyseal region of metacarpals and phalanges has been found to be the common site of GCT (3, 4). Brown tumor is one of tumors with very similar pathology to the Giant cell tumor. Brown tumors are associated with secondary hyperparathyroidism (HPT) in patients with chronic renal failure or parathyroid adenoma. Although primary hyperparathyroidism (HPT) is mainly caused by a single parathyroid adenoma in approximately 80% of cases and rarely by multiple adenomas or hyperplasia, carcinoma may lead to HPT in 1-2% of cases (5). We present a case of brown tumor confused with giant cell tumor of the fifth proximal phalanx of the right hand and treated by parathyroidectomy. A 44-year-old woman referred with a nine-month history of increasing swelling and pain in the fifth proximal phalanx of her right hand without any history of trauma or infection (Figure 1). In physical examination, there was a palpable, firm, and non-mobile 2 × 1cm mass. The mass has been progressively growing with a natural pain. The pain was not responsive to analgesic or NSAID (anti inflammatory drugs). Proximal interphalengeal phalanx and metacarpophalengeal joints motion was impaired. Radiographs showed an expansive lytic lesion of proximal of the fifth phalanx bone with cortical destruction and soft tissue involvement (Figures 2A & 2B). Chest radiographs and primary laboratory tests including cell blood count, ESR, and CRP were normal. Whole body scan suggested unifocal hypervascular tumoral lesion in the fifth proximal phalanx of the right hand (Fig 3). During the initial evaluation of patients, we had not done a thorough review of laboratory and one of our weaknesses. For no other clinical symptoms in patient and radiographic evidence was led astray. Incisional biopsy was performed since there were evidences of bone involvement and probability of malignancy (Figures 4A& 4B). Histological findings of the macroscopic section referred to presence of multiple cream brown gritty fragments of tissue whereas microscopic findings showed large numbers of distributed multinucleated giant cells with sheets of mononuclear histiocytic cells in the background. Then, further laboratory studies were conducted and indicated to very interesting findings. In early stages of diagnosis, further tests were not considered. However, the blood chemistry results were as follows: Serum calcium = 15.6 mg/dL (normal range of 8.5-10.5), serum intact PTH (IRMA) = 1568 pg/mL (normal range of 10-65), serum phosphate = 1.7 mg/dL (normal range of 2.5-4.5), and serum alkaline phosphatase = 822 IU/L (normal range of 37- 147). Although pathology report indicated to giant cell tumor, therefore, parathyroid adenoma was suspected. The patient was referred to a general surgeon. She underwent surgery and parathyroidectomy. The patient was followed up for 12 years and the neoplastic lesions were gradually disappeared. Finally, there was not any symptom of the disease. Figure 2. Radiographic findings of proximal phalanx mass with cortical destruction. GCT of the hand is uncommon and seems to be different from conventional GCT occurring at other sites of skeleton. Comparing with other parts of body, GCTs recur more rapidly in hands (1, 2). Most giant cell tumors occur during 30s and 40s of life. It occurs adjacent to knee joints in approximately 70% of cases and the distal radius is the second most common location (3, 4). Primary hyperparathyroidism is the third most common endocrinologic condition following diabetes mellitus and thyroid diseases (5, 6). Approximately 2% of the patients are reported to develop osteitis fibrosa cystica, and 0.8% develop Brown tumor. 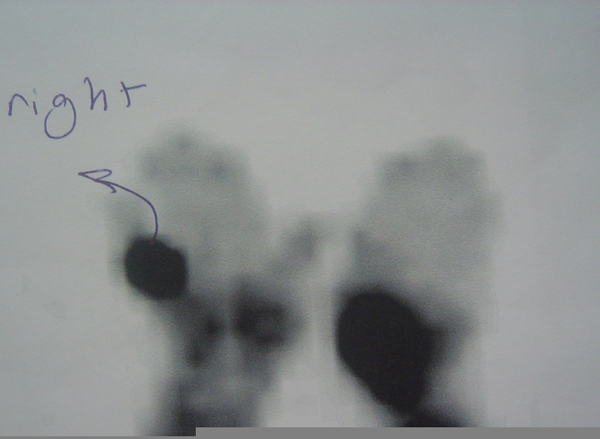 Brown tumors is primary treated through surgically remove the associated parathyroid pathology (6). Brown tumors generally regress spontaneously over time (7). Return of serum PTH, calcium, and phosphor levels to normal range is an indicator of the successful treatment (7). According to our observation, primary hyperparathyroidism should be kept in mind due to high similarity found between giant cell tumor and brown tumor. Clinical suspicion and diagnosis is of special importance because of different management and treatment methods. Giant cell tumor is treated through resection and curettage. However, major factors should be primary treated in brown tumor. 3. Giant cell tumor of the small bones of the hands and feet. Seminars in diagnostic pathology.